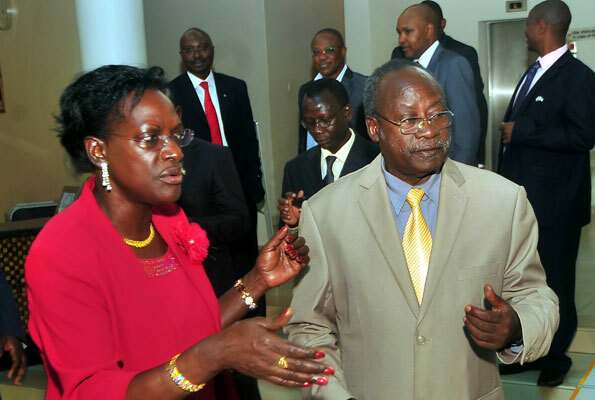 Ms Justin Bagyenda (left) shares a light moment with Prof Tarsis Kabwegyere at a past event. Courtesy photo. KAMPALA. The Bank of Uganda has ordered the freezing of accounts of D9 Company that operates like a pyramid scheme. The company is managed by a one Mr Magara Protus Smart. A pyramid scheme is a form of investment in which each paying participant recruits two further participants with returns being given to early participants using money contributed by later ones. The practice is illegal in a number of countries because it is seen as manipulative. Mr Bagyenda asked all commercial institutions privy to the letter to provide Bank of Uganda with account opening documents of the respective accounts together with the account statements from when they were opened to date. The circular is signed by Ms Bagyenda and bears a stamp of the Housing Finance Bank dated 28 June 2017.